RED (Renew, Energize and Donate) Day is a Keller Williams Realty service initiative dedicated to improving our local communities. All Keller Williams Realty associates in the United States and Canada were asked to donate their time on May 13, 2010 to renewing and energizing aspects of their local communities. Because of her constant commitment to the culture of our company, this day has been dedicated in honor of our Vice Chairman, Mo Anderson. 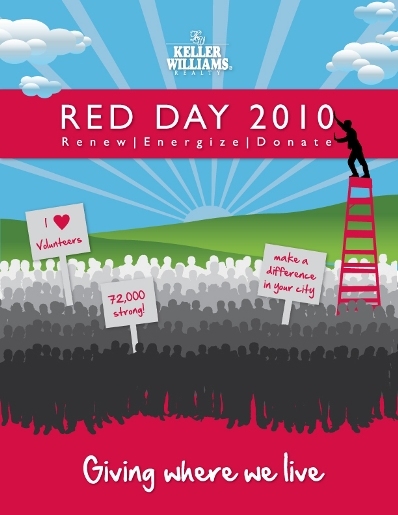 In 2011, Red Day will be held on May 12. If you are a Keller Williams associate please log in to the KW Intranet for more information about KW Red Day. If you would like further information on how you can help in your area or have any other questions please email [email protected]. Want to see the results for Red Day 2010? KW Associates - log in to see Red Day Tracking and Results! Like so many of you, I proudly put on my RED Day t-shirt last Thursday, and headed out into my community for the blessed opportunity to serve alongside Keller Williams associates. I got to participate in RED Day with three Oklahoma market centers – Edmond, North Pointe and Oklahoma City Northwest – and was touched by the power of our beautiful culture like never before. My day began with associates from the Edmond market center, who met at the Daily Living Center in Edmond to paint, garden and visit with the elderly participants in the programs there. Daily Living Centers provide adult day health care six days a week in therapeutic programs for senior adults who have a wide range of needs. The Gregg Foundation that I established in honor of my own parents is a supporter of The Daily Living Centers and it was a true joy to be able to visit with the elderly and spruce up the facility where they spend so much of their time. My next stop of the day was the Pauline E. Mayer Children’s Shelter, where I joined associates from the North Pointe market center in distributing blankets and other items on the shelter’s “wish list." This state-run shelter serves children who have suffered unspeakable abuse and neglect, and I am so heartened by everything that the North Pointe market center is doing to bring love and care into these children’s lives. RED Day came to a close for me with a visit to Positive Tomorrows – a Sanctuary of Hope. I joined members of the Oklahoma City Northwest market center in putting on a carnival for Kindergarten through fifth grade children who live and attend school there, because they are either homeless or have been removed from their homes. Witnessing the happiness on the faces of these children who have been through so much, was a reminder of the resiliency of the human spirit and what a gift it is to serve joyfully. You can click here for a video from the carnival. There could not have been a better way to celebrate my birthday, which was the day before on May 12. I am forever grateful to you for your generous spirits that have demonstrated in hundreds and hundreds of communities throughout North America that it is in giving that we receive.